In very good order, a rare late 19th Century British naval officer's sword, quite possibly still in active use at the time of Trafalgar. 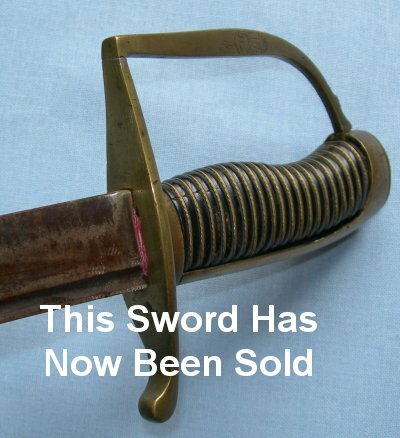 In well above average condition, this sword was made and worn sometime between 1780 and 1790 based on the blade type, size and hilt. 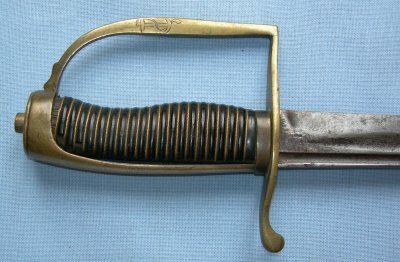 This era was very much a transitional time for the naval sword, this one having the facets of a slightly earlier "hanger" blade with a slightly later stirrup type hilt, though the blade and hilt are original to each other (just substantiating the date). Who knows where there sword has been and served. The typical 25 1/4 inch blade with twin fullers, the central fuller virtually all the way to the point, is in good condition except for some period nicks to the cutting edge. The blade is period sharpened and remains, to its credit, quite sharp to this day. The nicks look period raising the prospect this sword has seen very active combat use at a time when swords were still carried as weapons. The blade is firm in the hilt, the hilt generally very good. 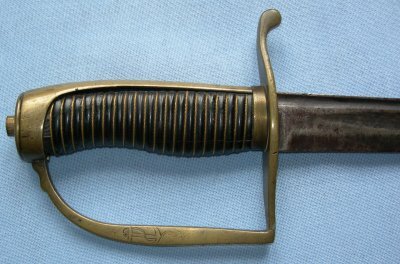 The turned walnut grip in very good condition for this type of sword, just some loss at the top and remarkably, the quite fine twisted brass wire bindings are present and correct. Fouled anchors to both sides of the guard / knucklebow; these are clearly period. Well worth the price tag. Further / full sized pictures available upon request. Item reference number B27 (458).